Identification Plastic Zip Ties | Flag Cable Ties | ID Zip Ties | Cal Fasteners, Inc.
For easy, one-step identification of wires, cables, and other bundled items, Cal Fasteners offers high quality ID flag zip ties. 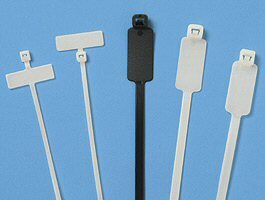 Manufactured from high strength nylon materials and available in natural and black, we stock identification cable ties in 18- and 50-pound capacities and in various lengths to meet your needs. ID zip ties help reduce snags while providing support for the bundle. Flags are designed to extend from the bundle for easy visibility. Additional features provide superior durability and ease of use. Advanced pawl, teeth, and transition rail designs, along with one-piece construction, give these flagged cable ties high tensile strength. Tapered tails and finger grips make them easy to handle and align. Low insertion and pull through force allows for fast and easy tightening. ROHS compliant. We also offer 18 and 50 pound cable ties in standard configurations. Request a quote on ID flag zip ties, or contact Cal Fasteners to learn more.